Back in August, we had a short 4 day trip to Brazil as the tickets were at a fairly good price, only $600 per person with United Airlines. We took the trip partially because I needed to get enough qualifying points to keep my United Gold Status. One of the highlight of the trip, is seeing the amazing Iguazu Falls. 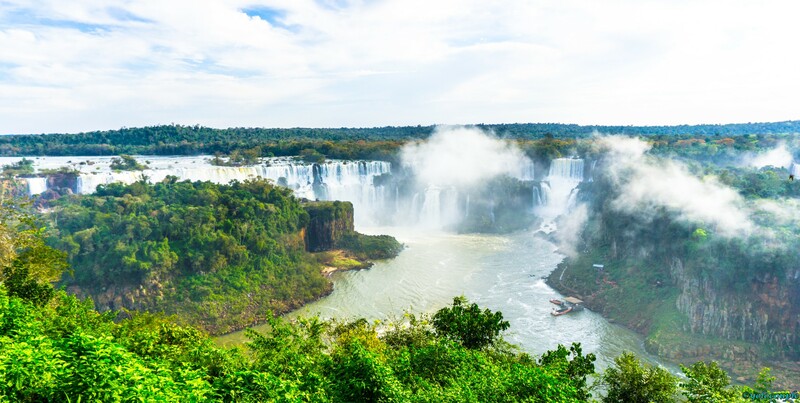 Iguazu Falls is considered by many “top lists” to be the most beautiful waterfall in the world. Width wise, it is very large, containing 275 individual falls. 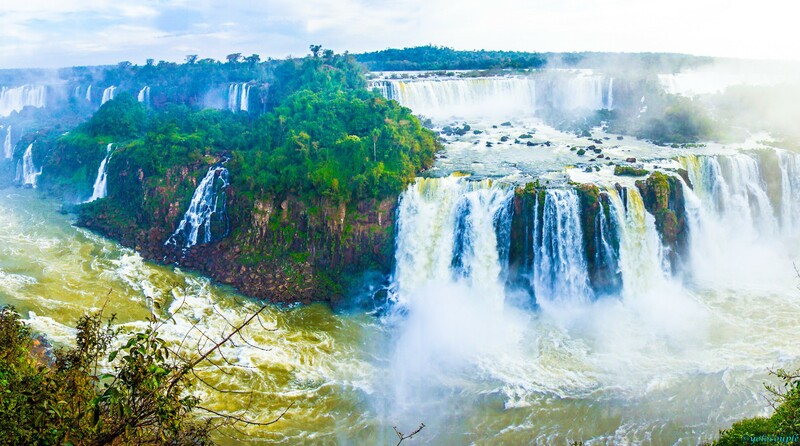 If you ever go down to Rio de Janiro or Brazil, I highly suggest you spend a day flying out to see Iguazu falls. You can even fly there in the morning, then fly back to the main city you are staying at in the evening. 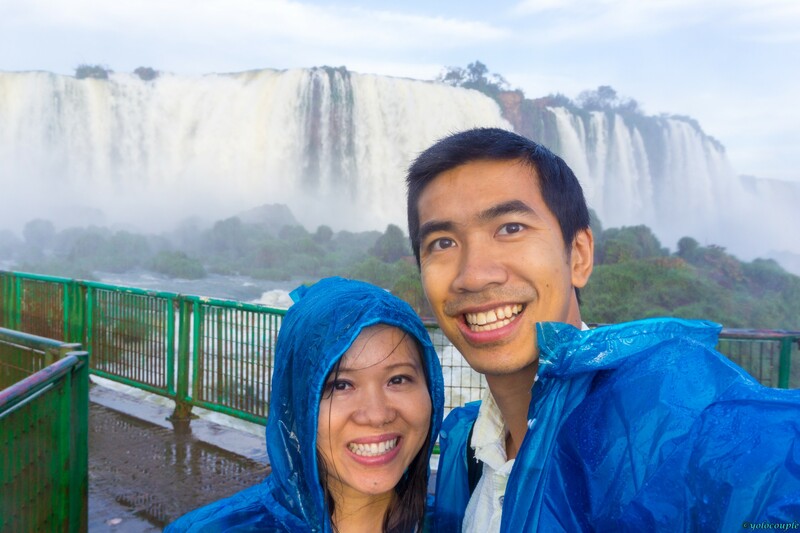 You only need to stay 1-2 days in Iguazu Falls, we were able to do it in one day. First view of the falls once you step off the bus. Sunset at the falls panoramic. 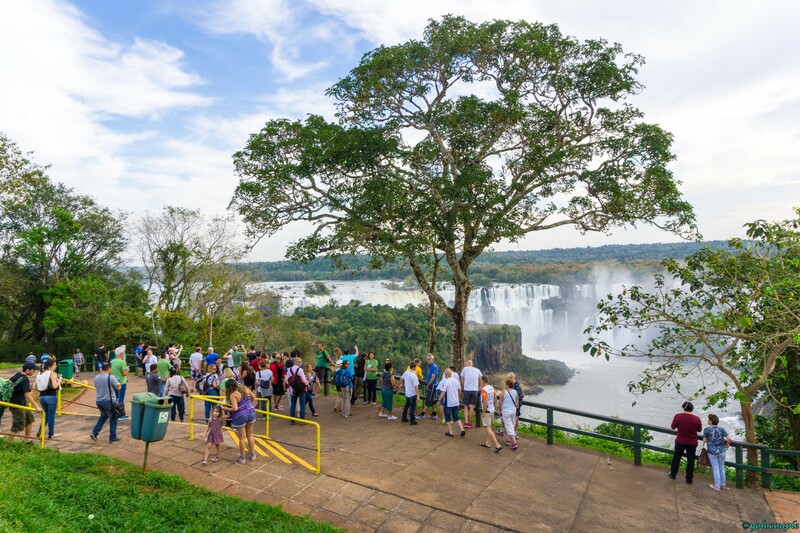 There are two sides you can see the falls, Argentina and Brazil side. Some people say the view is better from Brazil, which is where we went. Closest airport is Foz de Iguazu (IGU) on the Brazil side. There are no direct flight from the USA to IGU, so you’ll have to fly to Rio de Janeiro or Sao Paulo. Flights from either of those cities to IGU is about $100 – $150 per person round trip, and takes about 2 hours. 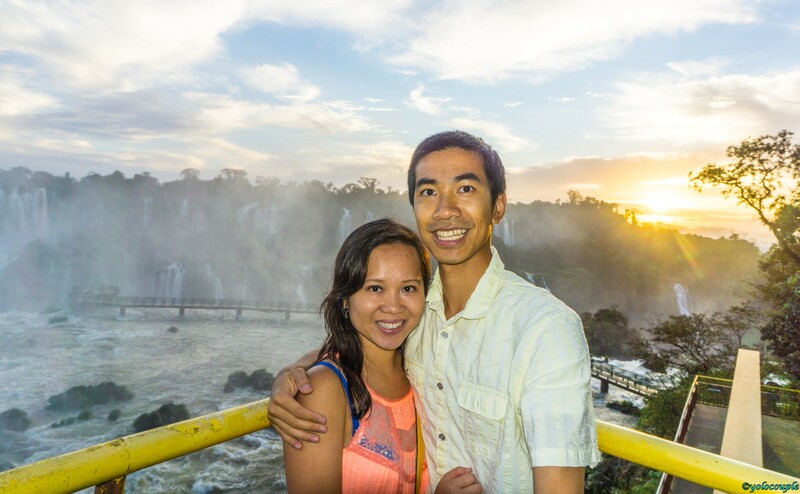 We flew from DC to Sao Paolo, Brazil and took a TAM airlines flight to Iguazu Falls (IGU). I used British Avios points and got free flights on TAM airlines for both of us (9000 points per person). 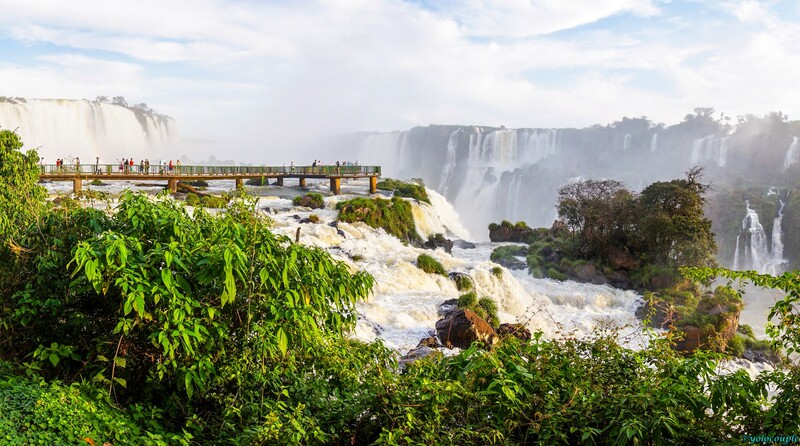 The airport is relatively near Iguazu Falls. I booked a hotel a few minutes from the airport, and then took a taxi to the falls itself. The taxi ride is about 5 to 10 minutes from the airport, cost about $20 Brazilian Reais (about $5) USD per taxi ride. The taxi can only drive you to the entrance of the falls. Once there, you have to buy a ticket (about $50 USD) that will give you entrance to the falls, and for the bus ride to the falls themselves. The bus ride from the entrance to the falls is about 15-20 minutes. Once the bus drop you off at the last stop, you just walk down the stairs and will have access to see it. The pathway goes around the falls, giving you different view points. Each “lookout point” gives a different view, so I suggest you take pictures along the way and not miss anything. It took us about 2 hours to see the whole waterfall, take pictures, and walk back to where the bus dropped us off. You can definitely stay longer, we had limited time so we didn’t stay as long. 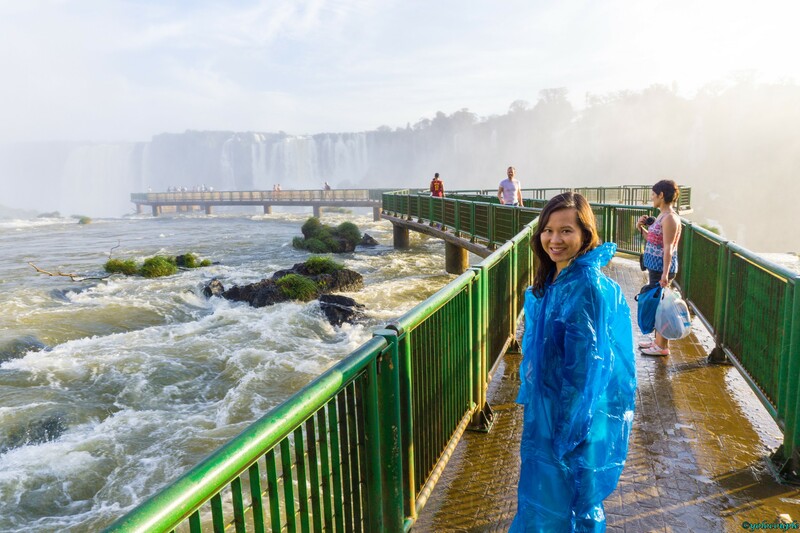 There are excursions that will take you deep into the falls and right under it, which we recommend you do. However, it would take a few more hours for those excursions. The falls itself is large, you can’t frame it all in one photo. As you walk on the path, you’ll get closer and closer to waterfalls that you can literally stand under. You’ll get wet for sure, but it was a great experience to feel the power running through the falls. There is a restaurant and souvenir shops at the falls, but other than that, there is no stores or anything else at the entrance or nearby. An important note when flying out of IGU airport. This airport is really small but super crowded. We arrived here on a morning flight to go back to Rio, and there were horrendous long lines! For some reason, the check-in lines are really slow, so the lines are long. We arrived 2 hours early but barely made it through to get on our flight. We were actually worried we would miss our flight. If your time is running short though, I would just use the “VIP” or “Business class” lines, as they don’t really even care whether you fly economy or business class to check you in. We recommend you arrive at the airport early (3 hours) before your flight. Image Gallery – Click on the picture to see a larger version. This is another view point of the falls. We walked for a few minutes from the entrance for this view. Near the end of the Falls, you’ll get to an area where you can walk out into the falls. There are people selling rain ponchos you can buy for a few dollars. View of the falls near the end. We walked into the falls, and got super wet! Sunset at the falls. The last bus to return is around 6pm, so be sure to know when you need to start heading back. ← Trip Planning Guide – How to know what hotels to book no matter where you go!